Wordlessness, 2017 Bedsheets, starch, thread, pins, newsprint. Wordlessness explores the nature of communication in artworks. With this piece I was trying to understand how material qualities and chosen treatments articulate meaning. Formally, the envelopes create rhythms in wave like patterns, echoing the distance between bodies, oceans away. 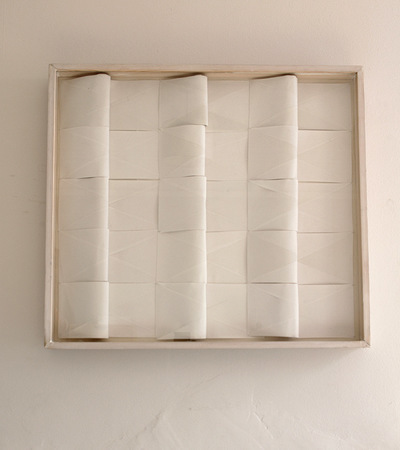 The envelope, understood as an obsolete technology used to physically surround, 'envelop' and transport words, also transports and connects to the tactile presence of the correspondent, the body with which one is engaged with in long distance communication. We rarely now send actual letters, which means there is a widening gulf separating us. Disembodied communication is a sad fact. This piece evokes the nostalgia of that loss. I use starched bedsheets to fashion the envelopes, strenghtening the sense of poignancy, of lost intimate proximity.